Launch Internet Explorer . Click the Tools menu, and then click Internet Options . 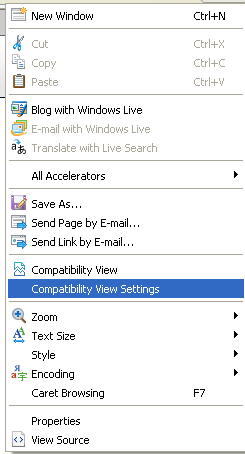 The Internet Options dialog box appears. Under the Privacy tab, click the Advanced button. The Advanced Privacy Settings dialog box appears. Enable the Override automatic cookie handling option. 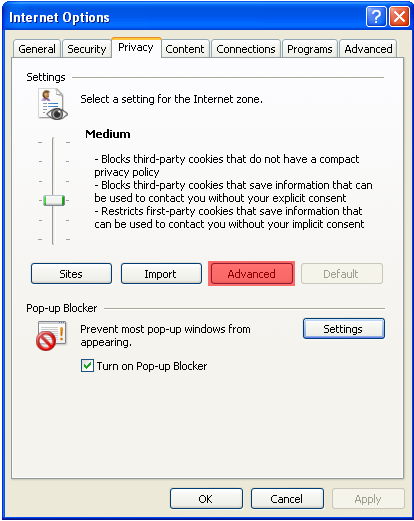 Ensure that the Accept option is enabled for First-party Cookies and Third-party Cookies . Click OK to exit the Advanced Privacy Settings dialog box. 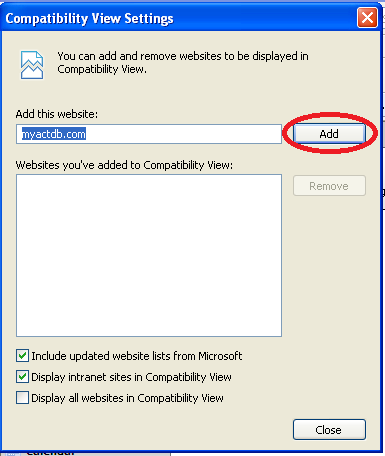 On the Internet Options dialog box, under the Privacy tab, click the Sites button. The Per Site Privacy Actions dialog box appears. Type the address "myactdb.com" into the Address of website field, click Allow , and then click OK to exit the Per Site Privacy Actions dialog box. 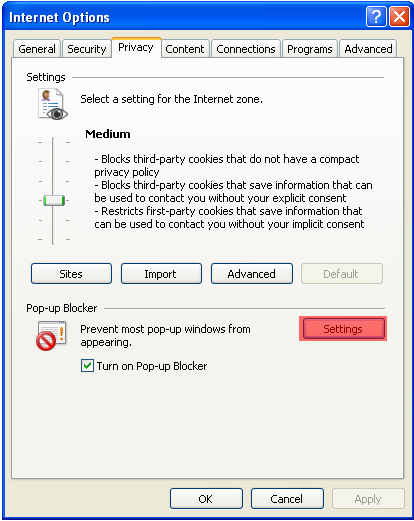 On the Internet Options dialog box, under the Privacy tab under the Pop-Up Blocker settings, click the Settings button. 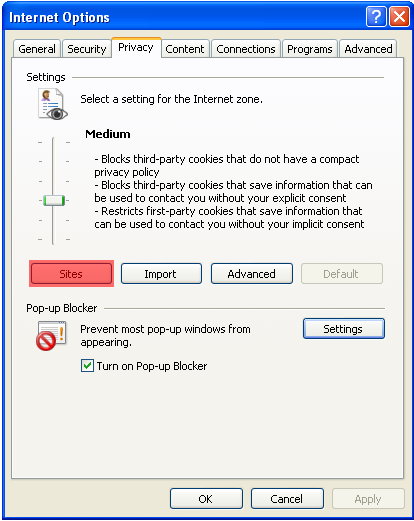 The Pop-up Blocker Settings dialog box appears. 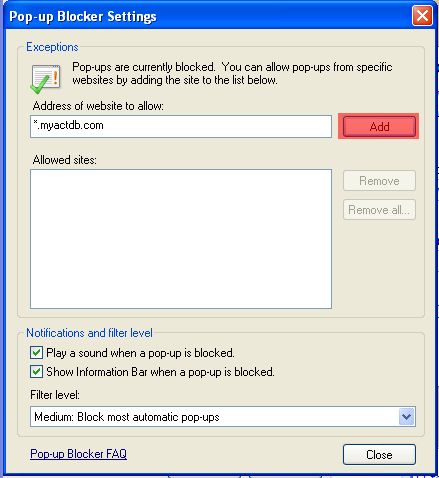 Type the address "*.myactdb.com" into the Address of website to allow field, click Add , and then click Close to exit the Pop-up Blocker Settings dialog box. In the Internet Options dialog box, Click the Security Tab, then Click the Sites button. Then click Close to exit the Trusted Sites dialog box. Click Apply and OK to exit the Internet Options dialog box. 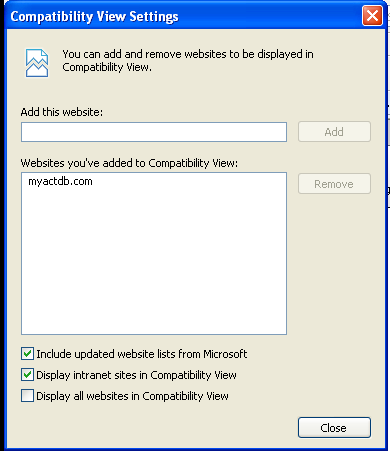 You may use the work-around of "Compatibility view" in IE 8 to get around this error.